We’re excited to announce new pricing! Now, the Personal plan supports unlimited sites and up to 3 free Guest users per site (a “Guest” is a single-site user with limited permissions, similar to an “editor”). The Starter plan also supports unlimited sites, but is designed for larger teams who need to manage many users across their sites and branches. Finally, our Enterprise plan is designed for large organizations with special requirements. Now we’re offering unlimited sites and up to 3 guest users per site on the Personal plan (Free). With our previous free plan, you were charged for each site that had multiple users and we felt it was too restrictive for people building simple static sites. This dawned on me when my brother got his Bluehost bill for a WordPress site that he used for his rock band (approx $100/year). Instead of paying it, he asked me to migrate his site from WordPress to Forestry + AWS, which would reduce his hosting to about $1/month. After migrating his site, I realized that even though the Forestry fee was small, we didn’t think it should be required for such a small site. For simple static websites (sites for non-profits, restaurants, bands, etc), hosting is essentially free and we feel like your CMS should be the same. Get up to 3 Guest users per site on all plans. A Guest is a single-site user with limited permissions (similar to an Editor). People typically use Guest accounts for clients, friends, or outside collaborators who want access to a single site. If you have a large team, the Starter Plan supports any number of users and a new Team UI to manage their roles. The new Starter Plan is designed to grow organically with your team using a per-user fee. 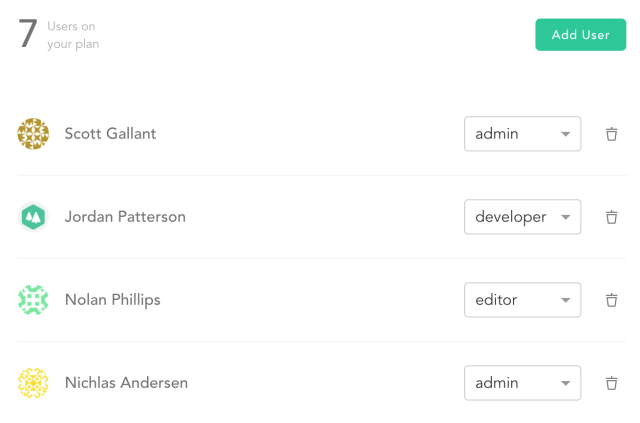 Now you can manage your users and their roles across all of your sites (and branches). The Starter plan starts at $29/month which includes your first 5 users and allows you to add additional users for $9/month each. The Pro plan is for teams that require better collaboration and control over their content with access control, editorial workflows, SSO, etc. The Pro plan allows for any number of users at $99/month each. We’re on a mission to help people craft and spread their message online. Whether you’re building a small site for your friend’s restaurant or a mission-critical site for your company, we feel that our new pricing helps you choose a static approach. If you have any comments or questions, don’t hesitate to contact us.